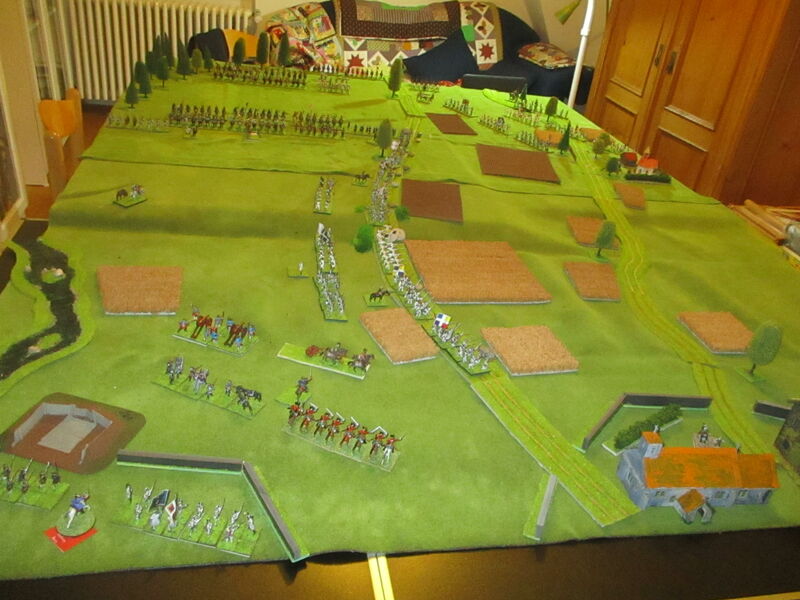 Today we fought the first 4 turns of the battle of Guastalla. H GL de Châtillon (Dep.) ? :3 x Cav. I GL Melun (Dep.) : 3 x Drag. J independent :. 1 bn. 1 FML Czungenberg (Dep.) : (KÜR Pálffy, KÜR Veterani, DR Württemberg) 3 x Cuir, 1 x Drag. The Allied view of the battlefield (or the view of my dear wife). In the fortifications: 2 batallions of Piedmont infantry. You know my plans to attack the French as soon as possible and saw a chance to destroy the army of Charles Emmanuel of Savoy by surprise. Czungenberger and Obrist Lindesheimb formed my Avantgarde. At the same moment when Czungenberger attacked the masses of French horse in front of him, the French used their second line of Dragoons and horse to charge Lindesheimb's leading companies of grenadiers. 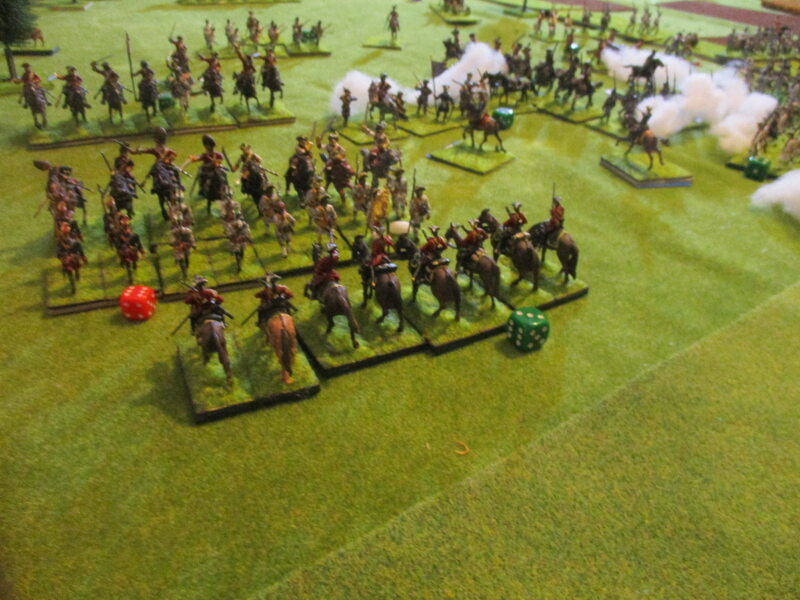 These French dragoons were repulsed and Czungenberger's cavalry fought bravely but could not break the French horse. The duke of Württemberg was eager to repeat the attack although the first line of Czungenberg's horse had to rally behind the second line. At least the enemy could not stop Lindesheimb's advance on the Piedmont-guards. The duke send me the message, that the enemy waited for our attack in a very formidable position behind the Arginello-road, which became a earthwork all along the Allied line. The weak point of the position was their left wing, although the Allies had their best troops there too. The Allies surely would change their formation and send reinforcements. 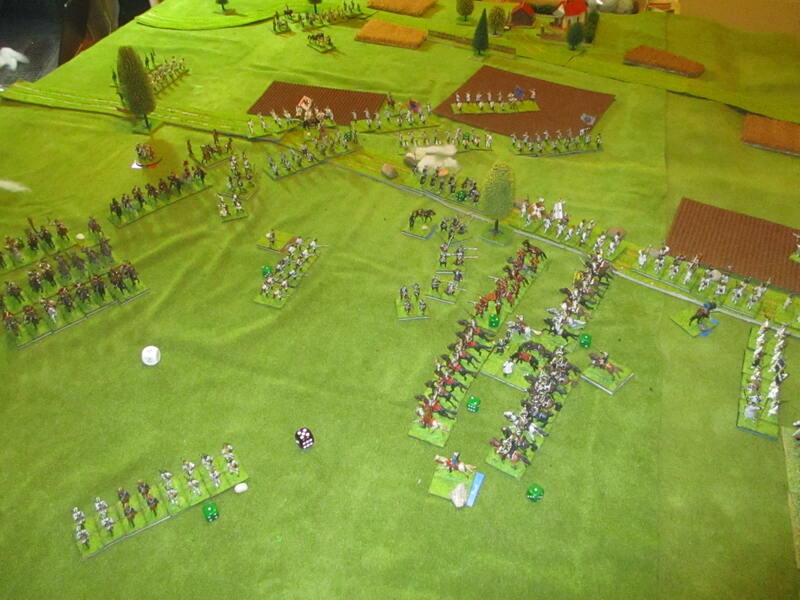 Our second line could break one of the French regiments of cavalry and the commanders of the French left wing decided to pull back the hole cavalry to reform. 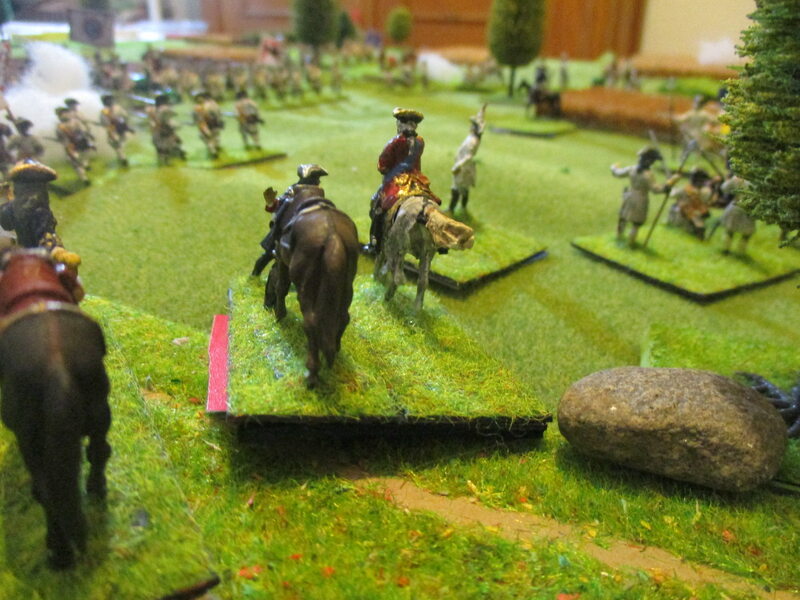 Finally the infantry of the Feldmarchall-Lieutenant Valparaiso was ready to reinforce Lindesheimb, who pulled back his grenadiers at the same moment to prepare a second assault. Unfortunately Valparaiso was'nt successfull. The Piedmont-guards fought with determination. 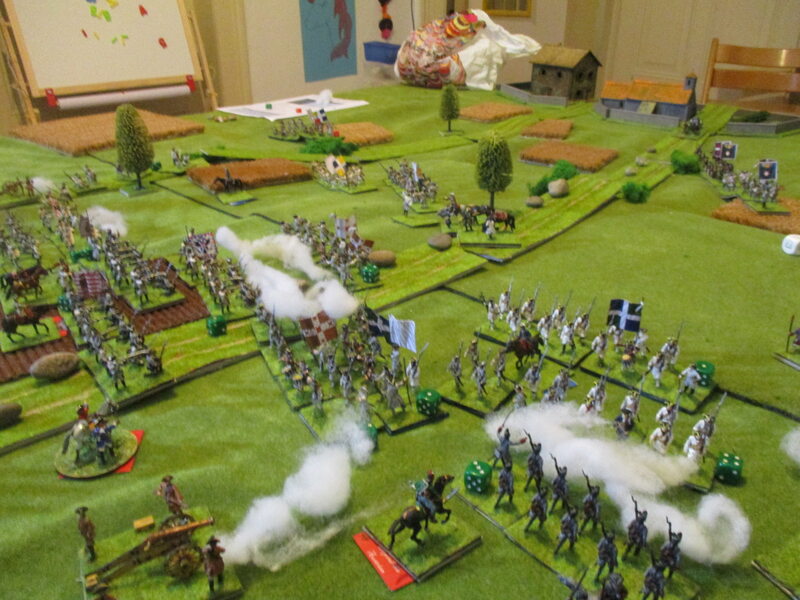 Lindesheimb ordered a second assault and finally the batallion of Piedmont-guards were broken and run! 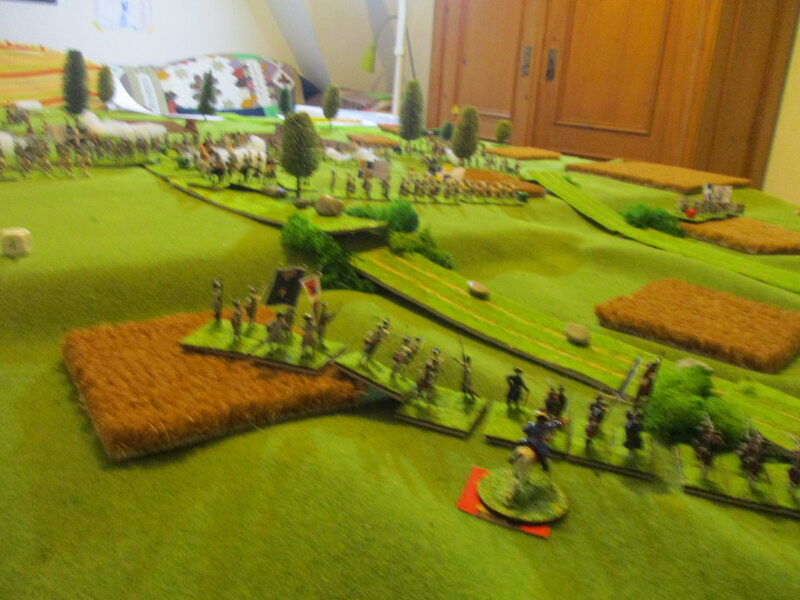 But now the king of Savoy himself could rally the French cavalry and surely persuaded the commanders of the French horse to stabilise the Allied wing, which could break under the pressure of Württemberg's hits. I had to be with Suckow and Valparaiso who didn't performed in the way I wished it. Czungenberger attacked again. But he could not progress. The king had placed one batallion of infantry at the banks of the river Po, which gave the French cavalry some firepower and strengh. But at the same moment the French had the same idea and advanced. Some red uniformed dragoons charged Lindesheimb's last grenadiers. 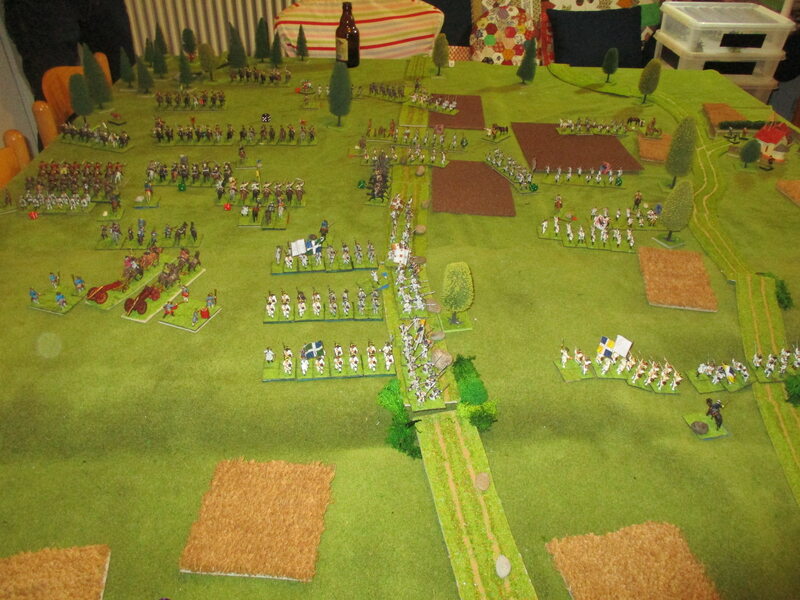 Our grenadiers retained their discipline and the French dragoons were beaten. 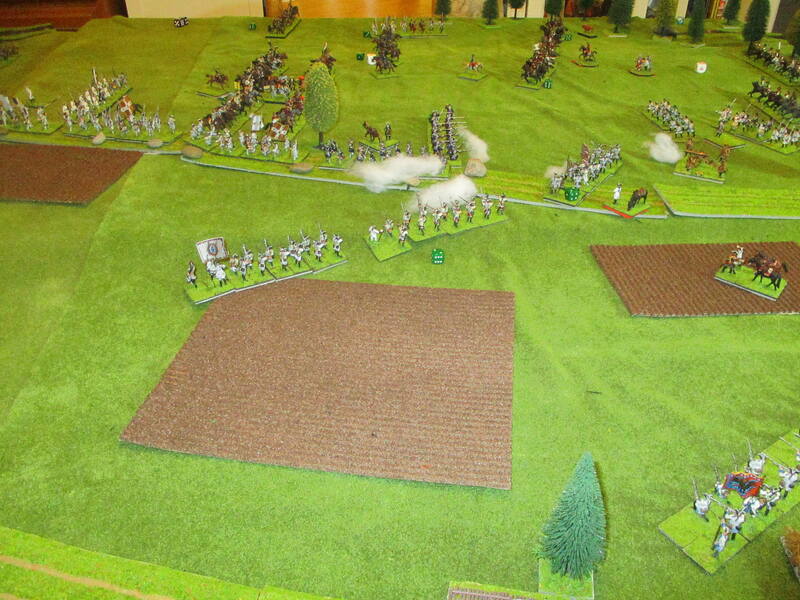 At this time Suckow observed that the French tried to attack our left flank with some batallions of infantry which abandoned their entrenchements. 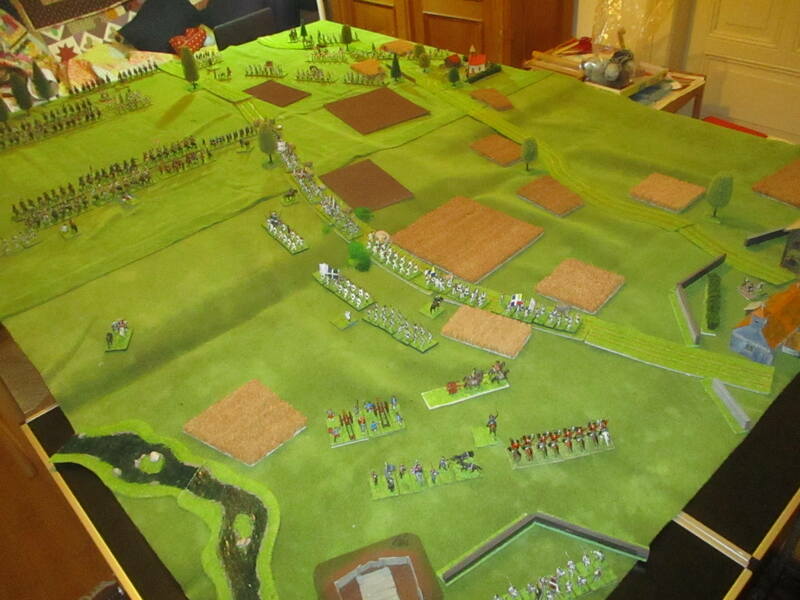 ..."
We packed away terrain and figures after 4 turns of fighting. The French lost 3 units (9 points left) and I lost 1 unit (8 points left). Now the battle reached the critical stage. I will have to act fast before the French can stabilize again their left wing which suffered much from the full power of Czungenberger's cavalry. Sachsen-Hildurghausen even now didn't arrived at the front which maybe will be of great importance for the outcome of the whole battle. We finished Guastalla yesterday night. "I saw no other option than to attack as I did before. 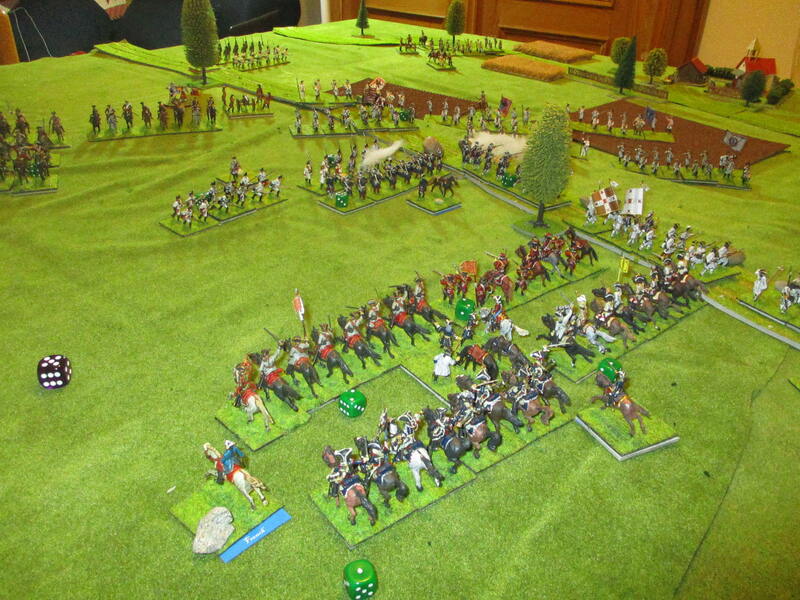 Finally GFWM Colmenero could attack and did very well leading his cuirassiers in the back of the Piedmont guards. Their general d'Affry was captured wounded. Czungenberger advanced to help Colmenero. 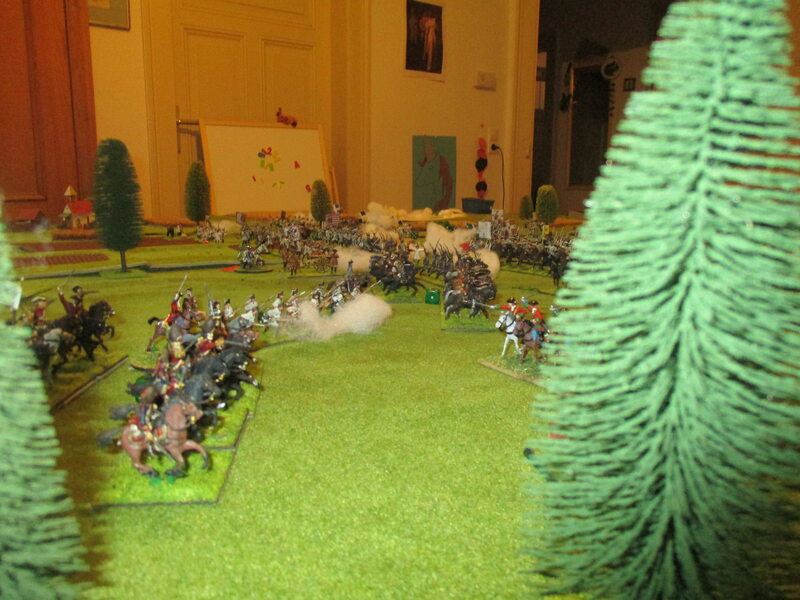 But it was clear, that the enemy send reinforcements and wanted to outflank my army. Therefor I had to order Suckow and Valparaiso to face this thread emediately. 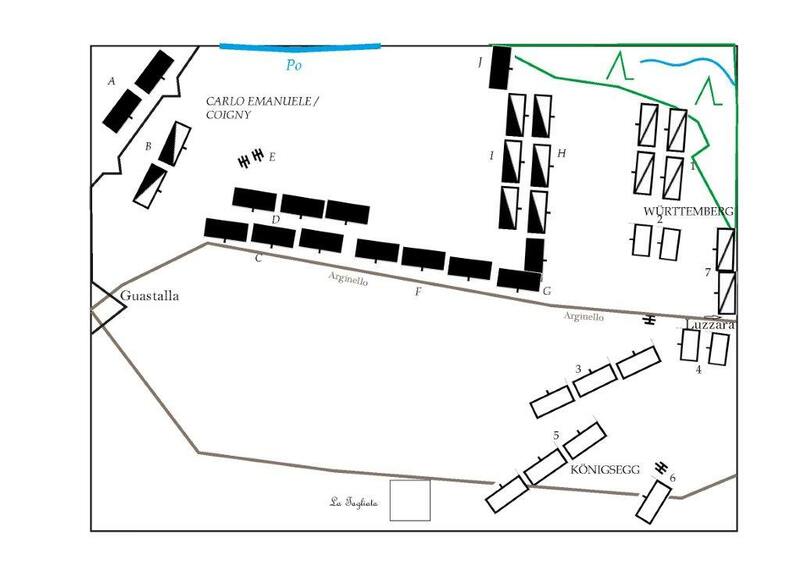 Suckow's and Valparaiso's brigades were mixed in a real chaos, some of the units still advancing towards the enemy at the Arginello, which was not longer of use for the enemy's defence, some of them just defending themselfs against fresh French batallions. 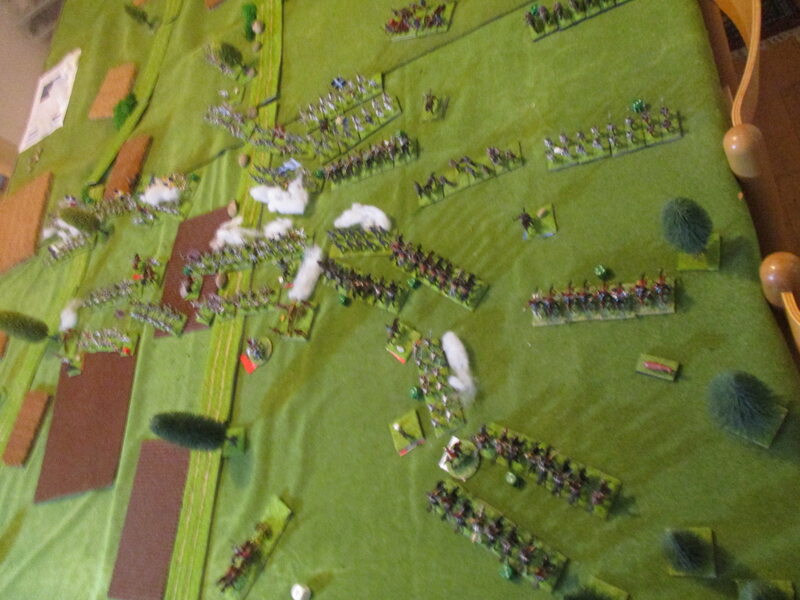 These French which attacked my left wing fired surprisingly effective. 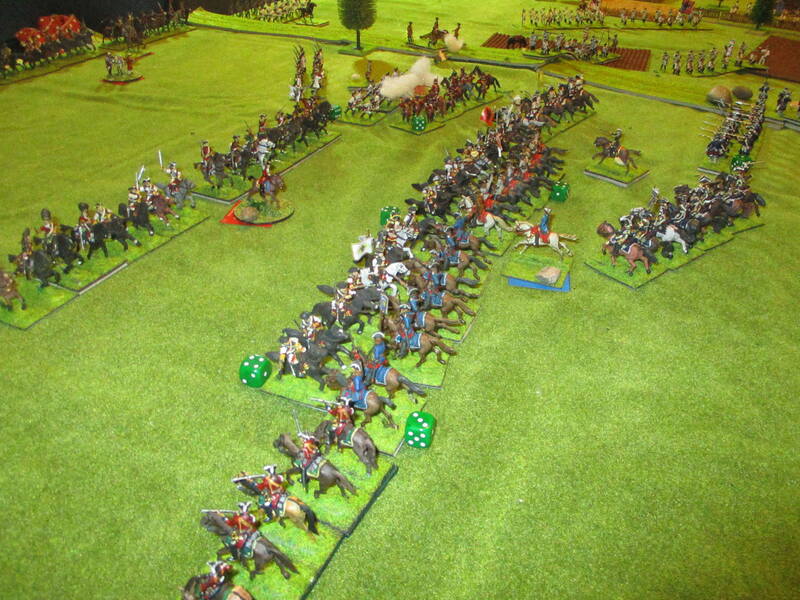 At our right wing the French and Savoys used their best horse units and the fighting was bloody and not decisive at all. The enemy horse captured Feldmarschallleutnant Czungenberger, which brought my whole wing in great trouble. Nevertheless finally the young duke of Sachsen-Hildburghausen found his way in the fighting and arrived exactly in the right moment when the French won the upperhand. 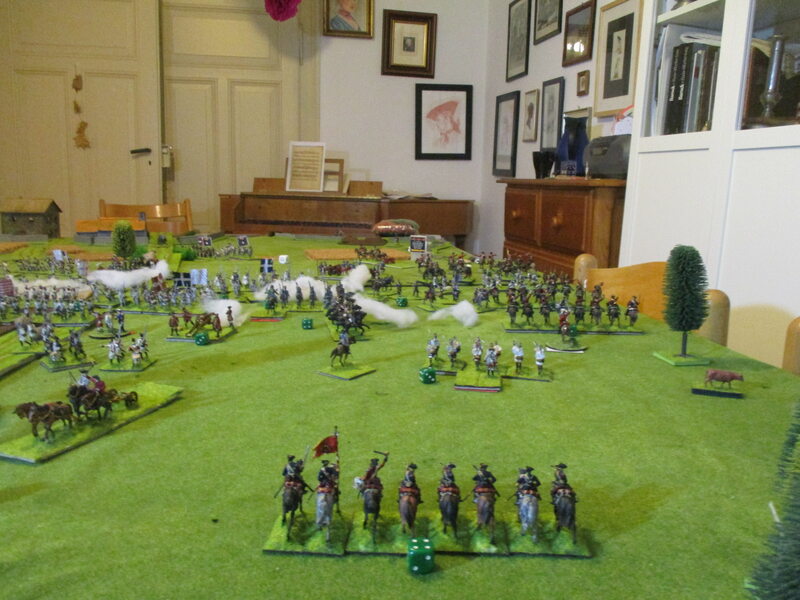 Some Piedmont-cavalry followed our fleeing cuirassiers and were shot in the flank by Lindesheimb's grenadiers, which came back into battle now. "I could hear the sound of our guns and muskets all along our lines. Our grenadiers and our artillery was successfull in our center to stop the French columns which were under the direct command of the king of Savoy. The duke of Württemberg send to me the message, that the grenadiers could fire at the last remaining French cavalry units. He was determined to break the enemy's left wing with his forces leading in person the charging and firing troops. Suckow's brigade was too eager to charge the enemy and some of his fusiliers charged and were cut to pieces. 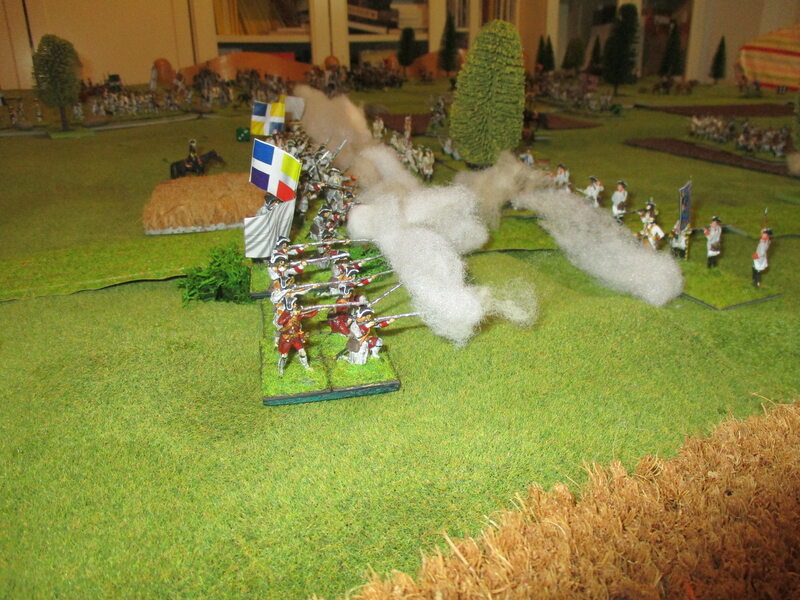 The French bullets cut the air. 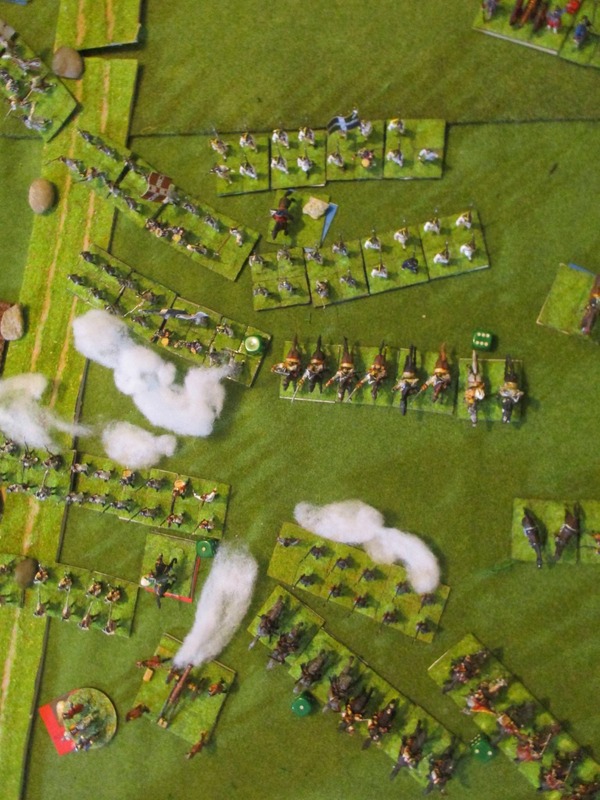 A real miracle happened at our left wing where the French charged one of Suckow's batallions in flank and front and both units had to retreat, one of them was captured! But the battle was decided at our right wing. The duke of Württemberg send his final message to me, that his elite cavalry not only could break some Piedmont horse but could ride down the French infantry behind them too and the destruction of them could break the whole French left wing. The last french horse were broken and rund. The last French dragoons wanted to retreat but run into the sword and sabres of our carabiniers and grenadiers at horse and were all captured. 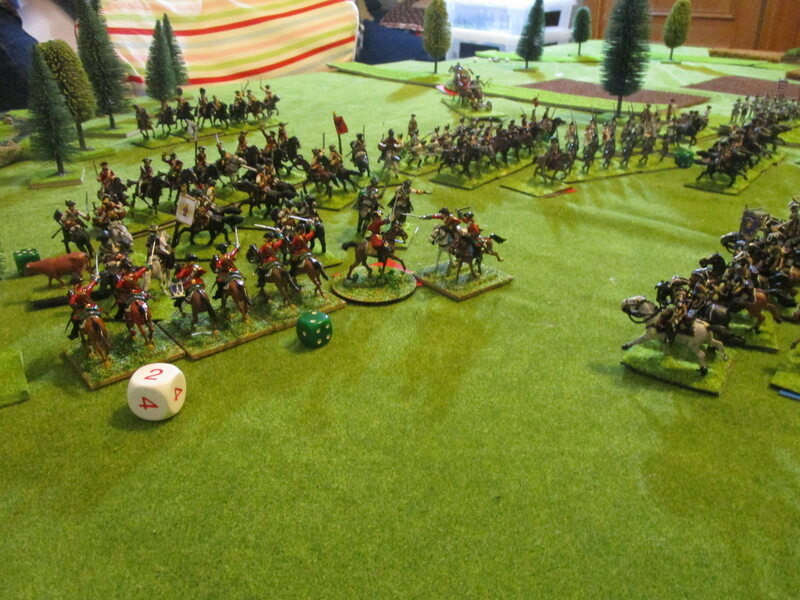 I heard that the duke of Württemberg himself rode at the crucial points of the battle. Finally he was killed by some French bullets when one of our grenadierunits were shot down. The French canister could not change the battle. And I heard that the king ordered the retreat of his broken army even before his own troops arrived from their first positions. 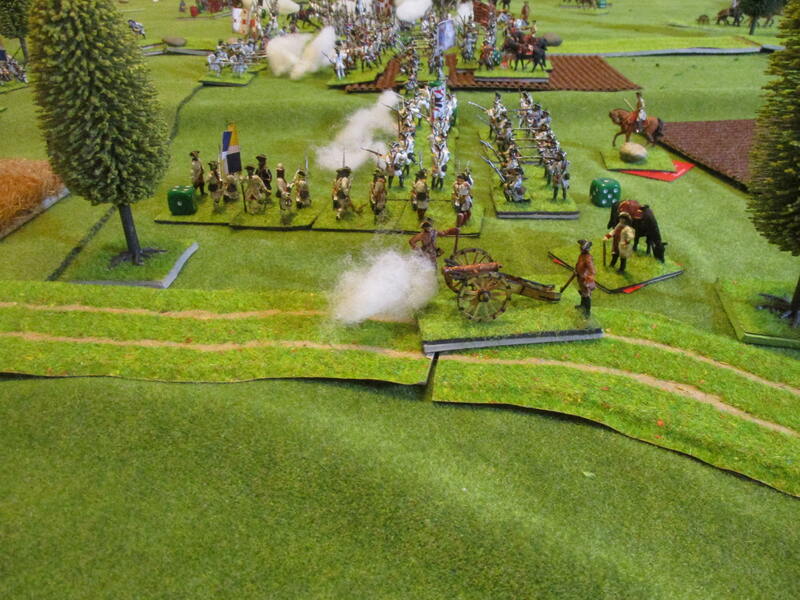 Maybe these Piedmont troops could save the way to retreat perhaps. But that doesn't change the fact that I can inform your majesty that your army in Italy won a decisive victory at Guastalla. I think that in the end I had a lot of luck on both wings. From the tactical point of view I never saw it as an option to attack the Arginello-road frontal. 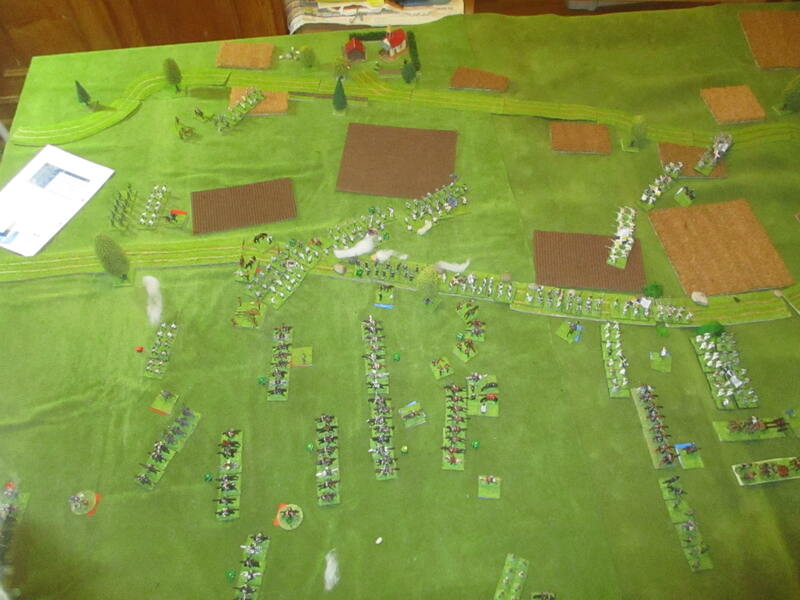 During turn 3 and 4 I had Suckow and Valparaiso in front of the Arginello but more to pin the enemy in his positions. 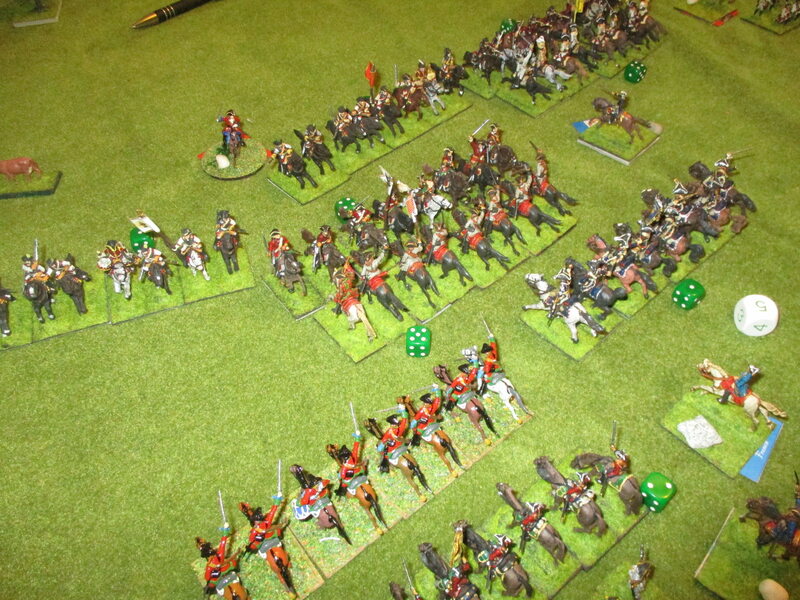 My right wing won the battle with my formidable cavalry in a combination with the grenadiers. As it is clear from the statistics, it was a close run battle until turn 8. I will change limit for the Scenario to 8 turns. Exciting report with many ups and downs and as I was reading it yesterday late night I was ready to ask you how close run was the battle, but you have fully covered me. 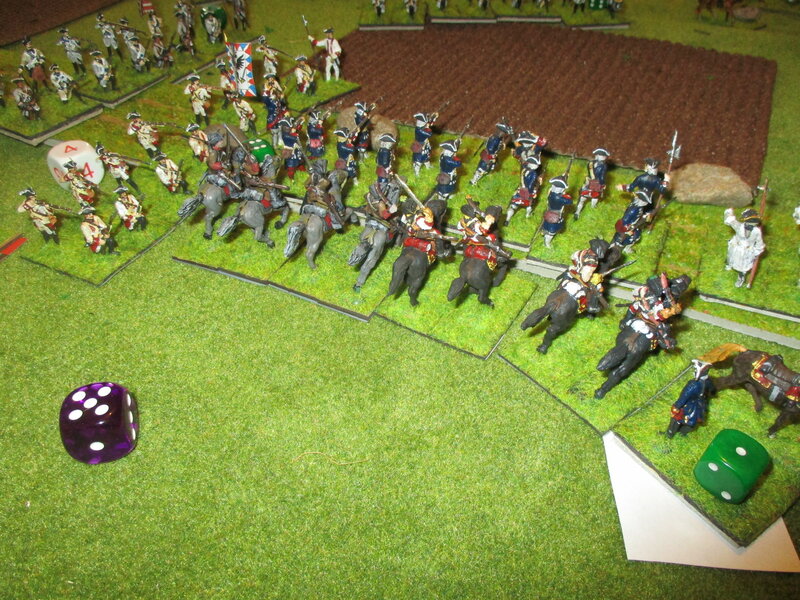 Yes, the iron fist of the Imperials is their good cavalry in combination with the grenadiers and this where the Franco-Savoian must put a lot of attention. I hope we'll play this battle soon and I will share with you how it went! I'm very glad, that you like it and I think now that you was right. 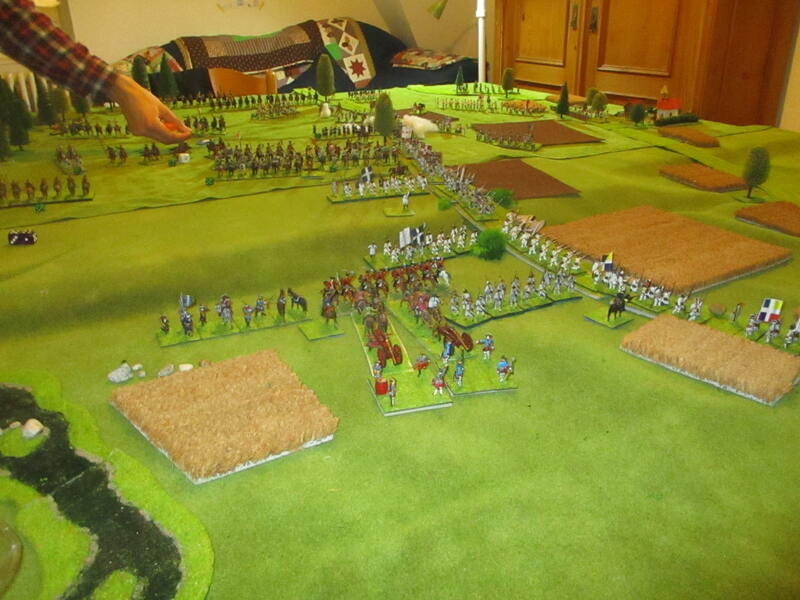 Guastalla is a very exciting battle. As you play the French normally I would wish you some lessons from my refight. This looks a really good game, very interesting scenario too. A question, nothing to do with the game itself! 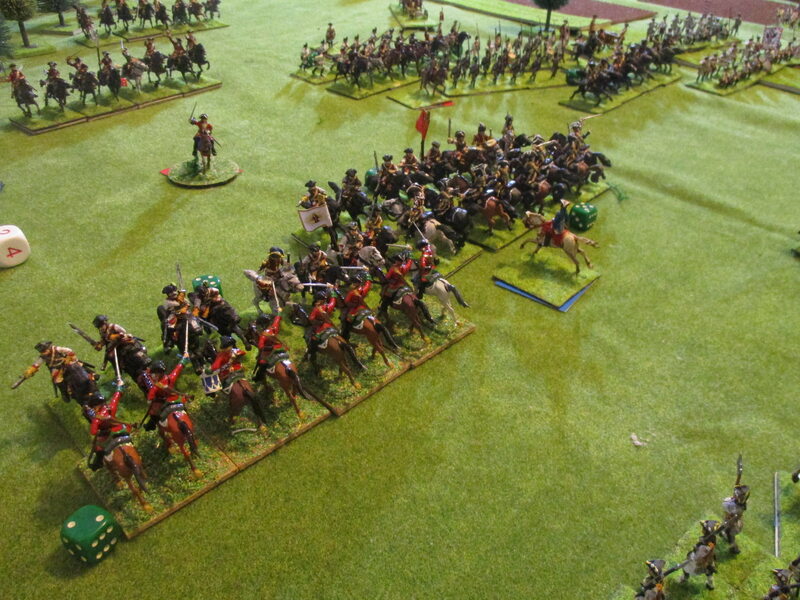 Rather the figures, do you find that with some bayonets on the plastic figures (e.g. the knelling firing) pertruding over the front of the base they get damaged? Even metal bayonets are at risk and I wonder if the plastic gets easily bent and loses it's paint? Am looking at basing Zvezda GNW Russians (which I think some of these are) in a way which minimises the risks to the paint being pinged off . Already taken damnitz advice re base sizes and know you favour 40mm x 40mm. Rather the figures, do you find that with some bayonets on the plastic figures (e.g. the knelling firing) pertruding over the front of the base they get damaged? Even metal bayonets are at risk and I wonder if the plastic gets easily bent and loses it's paint? Am looking at basing Zvezda GNW Russians (which I think some of these are) in a way which minimises the risks to the paint being pinged off . 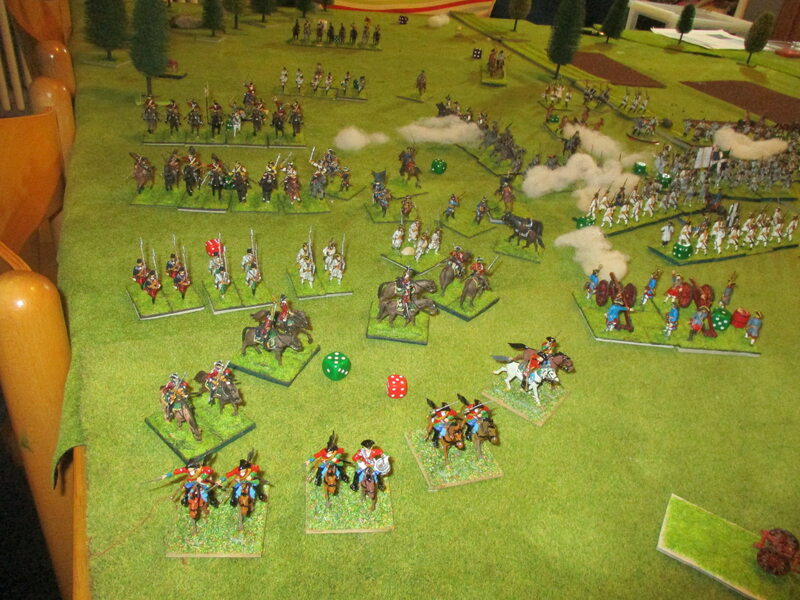 In my oppinion they are looking good and are an important Option because there are no cuirassiers else on the market. The reitars from Strelets GNW-range are a nightmare to glue together and to paint too. Thank you. 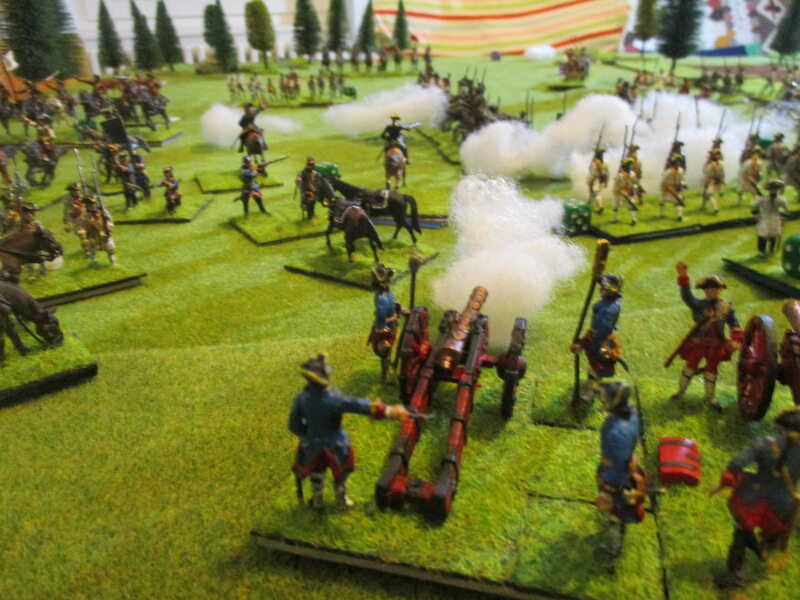 I ask as a I grew up with Airfix plastic Napoleonics where the plastic was soft and bendy muskets a big issue as it fired the paint off. So whilst you could paint them (or rather my Dad did!) they required lots of re paints from gaming damage. 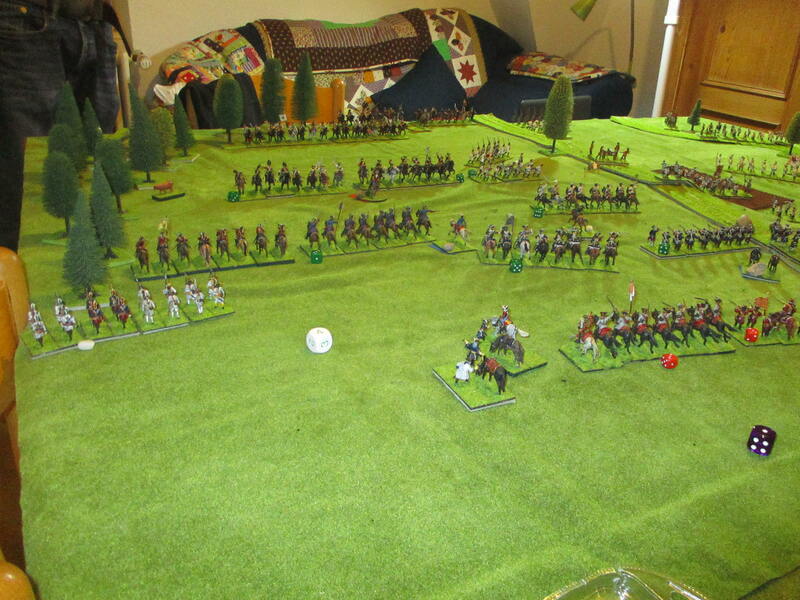 I know the newer plastics have improved greatly but my only other experiment was with late C17th, so no bayonets. I have got hold of a Zvezda box and they seem good figures, it is a pity they are now hard to get hold of. I have undercoated a unit and will start to paint and base soon. Thanks once again. I have got hold of a Zvezda box and they seem good figures, it is a pity they are now hard to get hold of. I have undercoated a unit and will start to paint and base soon. Thanks once again. I don't know why the Swedish are a lot more expensive. but I was also converting other figures from Airfix or Italeri. You may find some little issues with paint peeling off in a few muskets, but I had not done undercoat!?! But their general appearence is decent, although more than two decades had passed. All the figures are plastic, but we had never ever an issue with bending bayonets. And these figures could have shown some damage or wearing, as we play them quite often. Painted a few years later than mine. The cavalry swords or the muskets do not show any damage.